It's been a long road to recovery for Irish charger Seamus McGoldrick, aka Shambles, who attempted to beat himself unconscious with his own leg during a wipe out at Rileys a few years back. That doesn't mean it's been all herbal healing and downtime though, oh no. Shambles has just dropped a new short clip – touching on the injury, recovery and exactly what he's been up to since that fateful day three-years-ago. “The clip came together quite slowly, which was quite possibly my fault,” he says. Moment By Moment is what eventually emerged out of a creative process with director Yuji Shimobayshi. And what it means? “Stopping, observing, contemplating. Just for a moment,” Shambles explains. Major injuries such as this can take some time to recover. Even with months, years of rehab, there's no real guarantee you'll ever be back up to full strength. But that hasn't but a dampener on Shambles' borderline obsession to seek out only the hellish of kegs at home on the Emerald Isle. Anyway, we decided to check in with Sligo's premier member of the misbehaviours' club, talking new clip, that injury, recovery, Gearoid McDaid and Conor Maguire's positive contribution to the future of Irish surfing, what's next for Shambles and more. What’s new in the world of Shambles? All's good in the hood. 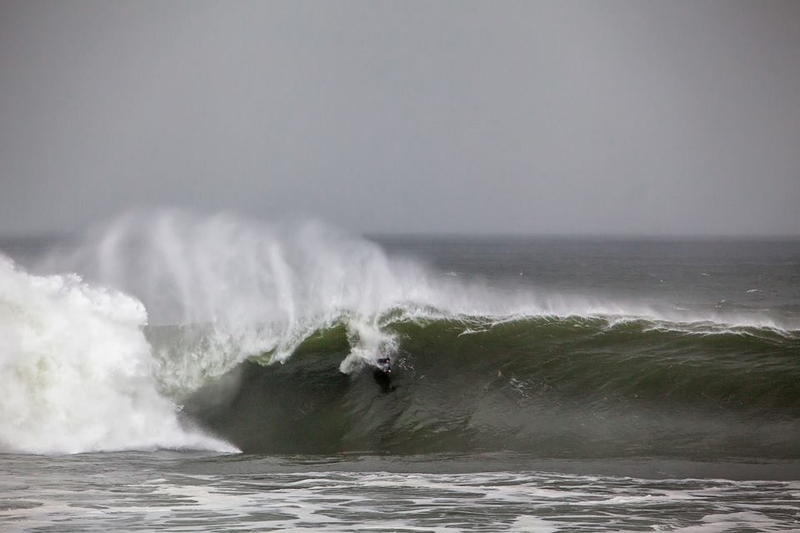 There has been some fun surfs recently here in Sligo. I've been working on a blog for my surf school and a new website [shambles.ie] is coming soon so watch out for that one. The revolution will not be televised. Remember a few years back, snapping your femur, all recovered now? I'm 98 per cent recovered, 99 per cent on a good day. With a femur break I didn't expect 100 per cent recovery but the doctors and nurses in Limerick regional took such good care of me I feel like I am back to where I was before I had my accident, which is a really pleasant feeling. Back in Bundoran before Christmas, we had a great run of swell and I felt as fit in the water as I did before the accident at Rileys. Up to the accident, I had slowly been growing my experience and skill at the heavy waves in Ireland. I felt super fit and confident in the water and decided I felt strong enough to take it to the next level. That meant some pretty scary surf. Next thing I knew I was scratching my head in Limerick hospital wondering where it all went wrong. But when I was out in the water in December I felt like I was pushing the limits again. Afterwards, and my therapist afterwards told me I had overdone it. She was right and I felt it. my right leg and shoulder felt knackered. Even though I had overdone it slightly it still felt like an achievement. I think I got one of the best waves of my life that session and about 500 of the best wipeouts. Heavy. How've you stayed sane in the downtime? The downtime was sweet. I had plenty of time to practice my banjo playing and I was working on a couple of writing projects. I learned a lot from all the people I went to visit to keep my health in the best possible shape for the recovery. 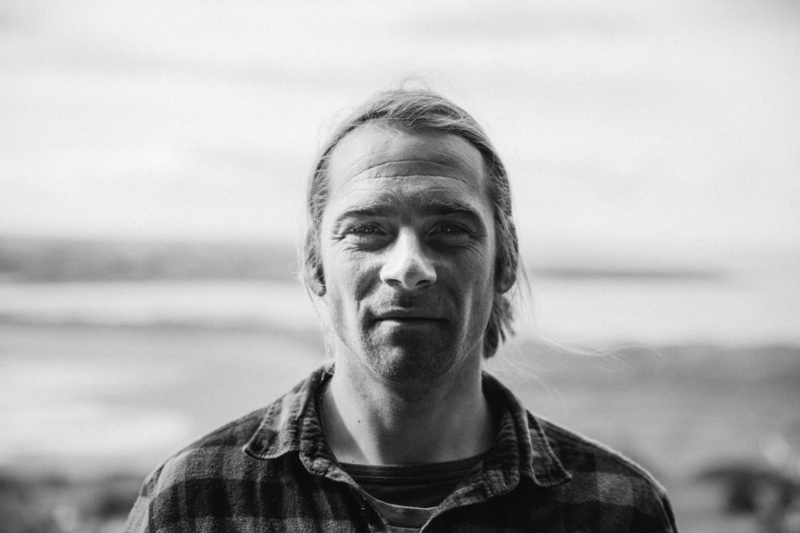 Gabriel McSharry is a really talented medical herbalist living in Sligo who I know through surfing. He put me on to all these healthy herbs and foods and really helped me out a lot. Another local surfer, Troy McClure, did all my physical therapy. I went to an acupuncturist three months after the accident, I had one session of acupuncture with her, she showed me some Tai Chi moves and basically taught me how to walk again and I walked out of her office without using my crutches for the first time. A woman who came bodyboarding at my surf school ended up becoming an amatsu therapist and she helped me big time when I was trying to get in shape for the Mike Stewart Pipeline invitation. So the downtime was pretty interesting. I learned a lot about my body and my posture because of my injury, which was a positive. And I wanted to mention my friends above by name because they are committed professionals who really helped me out. January a few years back, this behemoth hit. You recently dropped a new clip, Moment by Moment see above – which touches on the injury. What’s the inspiration behind it? Well, the clip is all Yuji's idea. Yuji Shimobayshi landed in Sligo years ago and never left. I have been friends with Yuji pretty much since he came to Strandhill. Now, he lives close to the beach with his wife and young daughter Sachi and, although he will never admit it, he is a true old school Strandhill crew member who has a full (and valid) Top Road SBNPO Misbehaviours club membership card. Yuji is practising organic farming nowadays. With his farming and his filmmaking and his pure love of surfing, I have taken to calling him Yuji Smith. I absolutely loved Yuji's idea for a film about my bodyboarding. He wanted to do a surfing film on me but I wouldn't be surfing in it. I thought it was brilliant, very zen. The clip came together quite slowly, which was quite possibly my fault, sorry Yuji. Yuji was painstakingly exact about precisely what direction things had to take in the film. He had it all worked out. Clem McInerney was generous enough to give us the footage to do the eerie outro I wanted, where you slip from the dream back into the nightmare. I was really stoked when Yuji came to film me coach surfing. Because apart from chasing waves in Ireland, or elsewhere, I have spent a lot of the last five years coaching. It is mostly at a beginner level but I really like watching the changes that come over people when they start going in the sea more regularly. So I guess that is what Moment by Moment means. Stopping, observing, contemplating. Just for a moment. Because how else are you going to spend downtime in Ireland? How was the winter in Ireland? Tell us about that slab session from Backstop? Yeah, that session was primo. I don't think anyone was expecting that swell. Marky from Fourth Surfboards was over, we had Ryan Watts around, Aaron Reid, Murf, Noah, Gearoid and Conor Maguire around who were up for it and the waves went mad for a few days with an epic small crew. The only person missing was Cain Kilcullen. 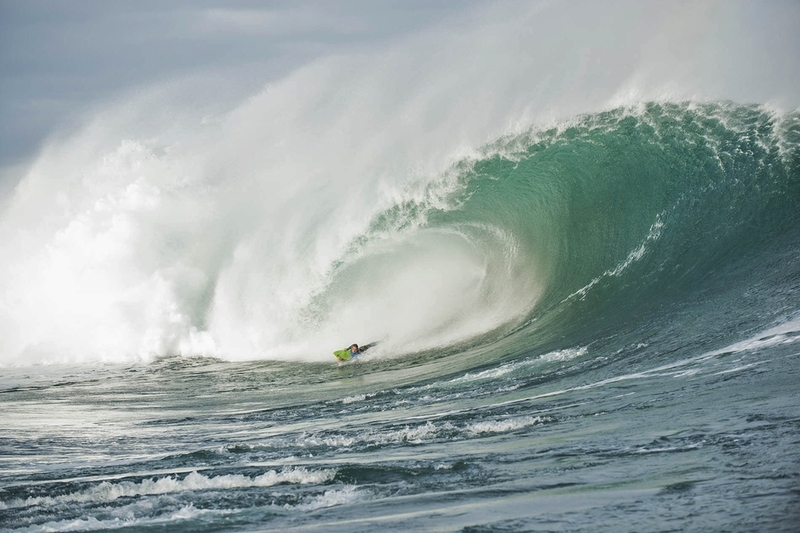 He is still the best surfer in Ireland. 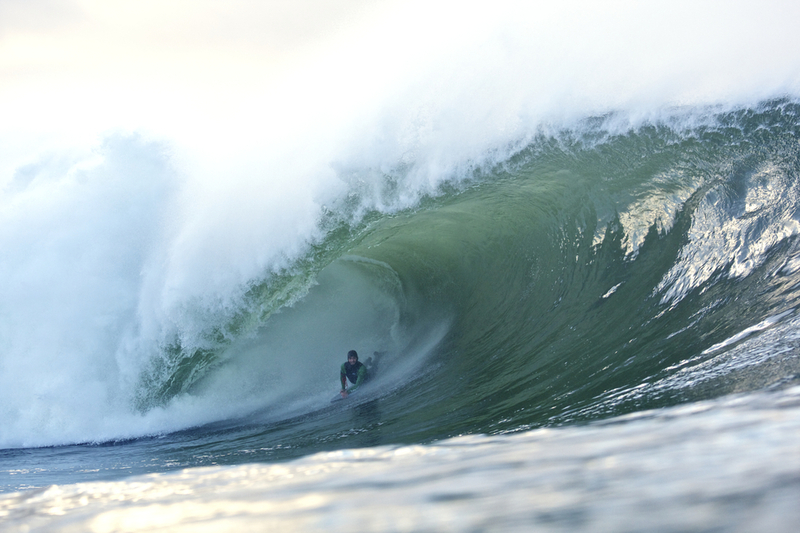 I was so stoked to see Gearoid McDaid ripping it up in 8 – 12 ft psycho pits. He is now a mean machine and just won the Wave of the Year at Doolin Surfest for a paddle in bomb at Mully. But the best for me was hanging out with [filmer] Peter Clyne and [South African charger] Josh Redman. My van was in the garage and Peter offered me a lift on the first day of the swell. I had no idea Josh would be there. He flew over on a wing and a prayer hoping for Mully. Mully didn't happen but that didn't stop Josh going into full froth mode and getting some serious pits. I remember rocking up on the third morning and racing out there with him to catch it before the wind changed. Out the back, we began paddling over set after set wondering how to catch a wave. One set never ended. The waves just kept getting bigger and we were getting pulled back. After two more waves, I noticed Josh was no longer with me and I was out there on my own. He must have got an awful pounding. I was petrified. I scrambled over the next wave and just about made it. Poor Josh, on the other hand, got it square on the noggin. I waited around until Josh joined me back in the lineup and I think we got one more wave each and we went in. But it was a hectic morning. One day, I had been out surfing with Conor Maguire for over an hour and the waves were still in the 5-6 foot range, below average, and I was about to go in. Then one sick wave came through and Conor said maybe I better stay out, just in case. So we were chatting for another 30 mins or so and no sign of the swell. It was great just catching up with Conor but the waves were still super average. 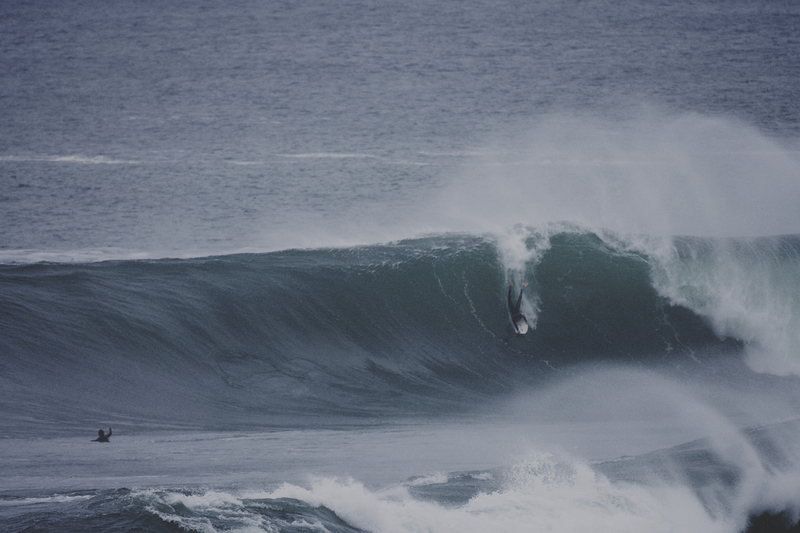 Then Gearoid McDaid paddles out and catches three perfect barrels in a row. They need the space and time to focus on surfing their own waves in peace and focus on doing what they are doing, which is taking Irish and global surfing to the next level. Noah Lane turned up and paddled into three pretty insane waves, riding so deep in the barrel. He came back into the line up and turned his board over and realised he had been so excited paddling out that he forgot to screw his fins in and most of them had fallen out. Hilarious. I remember taking a crazy closeout, snapping my leash and having to swim in. I was chatting to Dylan Stott on the cliff. He was out for a stroll with his son Axel watching the show. We were chatting about how crazy the conditions were and how it would get crazier with the rising swell and dropping tide. I dashed back out and caught another wave and straight away I snapped the second leash. I went, 'balls to this'. I had no more leashes left in my van. When I got my board back I simply tied the two bits of leash back together in a knot and paddled back out. The next wave I caught was a big barrel, the leash held and I made the wave. I was delighted. It was one of my waves of the winter. How’s the vibe in Sligo right now? Sligo is great man. 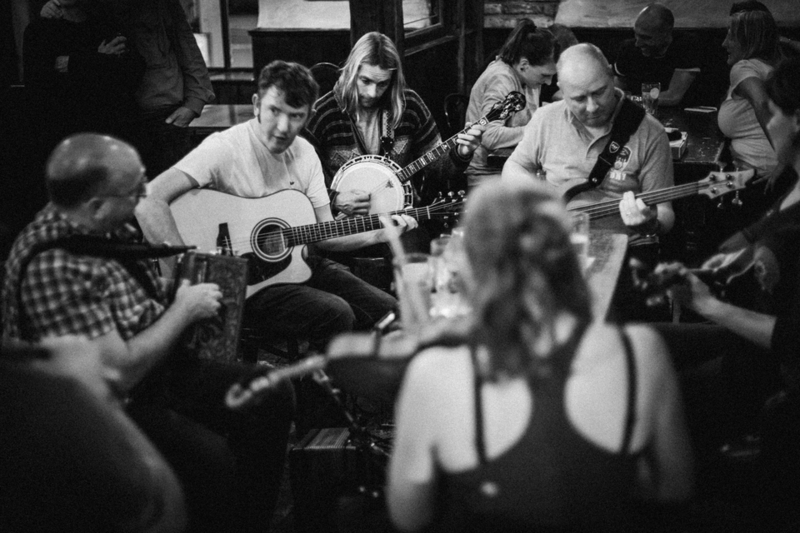 There is a world-class roots and live music scene in Sligo. You can do so much adventure activities and the people here are great and come from all over. Shane Meehan opened a new restaurant in Strandhill called Stoked and its food is off the hook. It is exciting to have a sick new place to eat at our local beach. Anything planned in the future? I am working on a number of projects in Ireland and abroad and fingers crossed they all come together. You'll be the first to know if they do. I have been working hard on the Friends of Tom Morey campaign which aims to provide financial assistance for surf legend Tom Morey and his wife Marchia. To date, Tom has received two eye operation to help him partially recover his sight. Apart from that, I am happy working in my surf school in Strandhill, Sligo. People tell me I have pretty much the best job in the world. Teaching surfing in winter is pretty cold but I am used to it at this stage. But summer is around the corner and I run a really cool surf camp when the kids get off school for the summer holidays. That usually sees me through until September, October. Then, hopefully, there will be a few bodyboard contests to do down in Portugal or Spain. I really love going down there and there really is a sick bodyboard community between Morocco, Spain, Portugal, France, UK and Ireland. Alex Uranga came to Ireland with his girlfriend recently. He was driving her to Galway and the Cliffs of Moher and the Giant's Causeway, you know the usual stuff, and he only had one day to surf. He ended up scoring pumping Mully. Lucky man. Thanks to an autumnal pulse. As framed by Marco Arellano.